The expense I find most interesting is item No. 54 on each expense list: Fines or penalties. Yes, indeed. You can see who has been good and who has been bad. I’m relieved to see my own company has a big zero in that category. Keep in mind that some of these agencies are small ‘mom and pop’ operations while others are large, multi-branch companies. I totaled just over 100 D-FW agencies with no fines or penalties and 11 with some amount of fine or penalty. 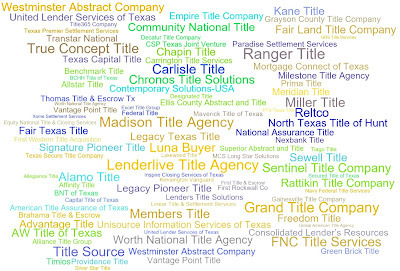 Independent Agencies: Advantage Title, Affinity Title, Alamo Title, Allstar Title, Allegiance Title, Alliance Title Group, American Title Assurance of Texas, AW Title of Texas, BCHH Title of Texas, Benchmark Title, BNT of Texas, Brahama Title & Escrow, Capital Title of Texas, Carlisle Title, Carrington Title Services, Chapin Title, Chronos Title Solutions, Community National Title, Consolidated Lender’s Resources, Contemporary Solutions-USA, CSP Texas Joint Venture, Decatur Title Company, Designated Title. Ellis County Abstract and Title, Empire Title Company, Equity National Title & Closing Services, Excel Title Group, Fair Land Title Company, Fair Texas Title, Federal Title, First Rockwall Co, First Title & Escrow, First Western Title Acquisition, FNC Title Services, Freedom Title, Gainesville Title Company, Global American Title Agency, Grand Title Company, Grayson County Title Company, Green Brick Title, GRS Title Services, Inspire Closing Services of Texas, Kane Title, Kensington Vanguard National Land Services of Tx, Lakewood Title, Legacy Pioneer Title, Legacy Texas Title, Lenderlive Title Agency, Lenders Title Solutions, Linear Title & Settlement Services, Luna Buyer. 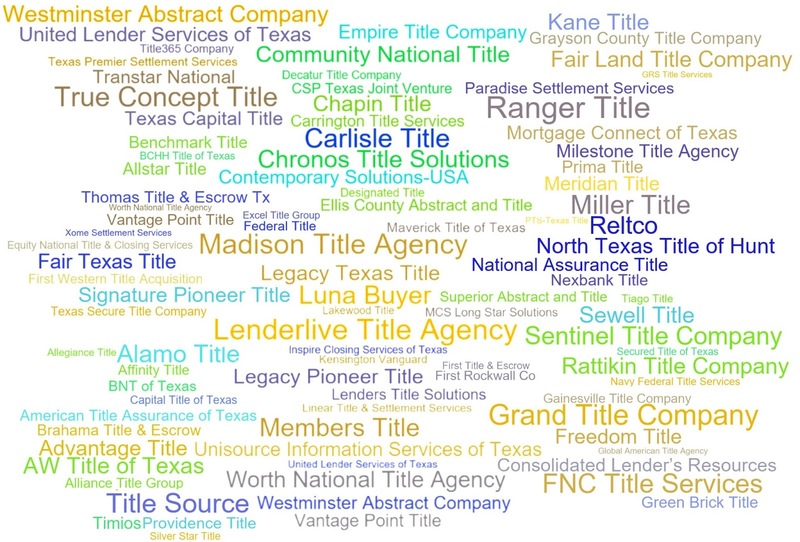 Madison Title Agency, Maverick Title of Texas, MCS Long Star Solutions, Members Title, Meridian Title, Milestone Title Agency, Miller Title, Mortgage Connect of Texas, National Assurance Title, Navy Federal Title Services, Nexbank Title, North Texas Title of Hunt, Paradise Settlement Services, Prima Title, Providence Title, PTS-Texas Title, Ranger Title, Rattikin Title Company, Reltco, Secured Title of Texas, Sentinel Title Company, Sewell Title, Signature Pioneer Title, Silver Star Title, Superior Abstract and Title, Texas Capital Title, Texas Premier Settlement Services, Texas Secure Title Company, Thomas Title & Escrow Tx, Tiago Title, Timios, Title Source, Title365 Company, Transtar National, True Concept Title, Unisource Information Services of Texas, United Lender Services of Texas, Vantage Point Title, Westminster Abstract Company, Worth National Title Agency and Xome Settlement Services. Affiliated Agents & Direct Operations: Chicago Title Insurance Company, Commonwealth Title of Dallas, Dominion Title of Dallas, HMH Title Company, Landon Title Company, Millennium title Company of North Texas, NETC Title Company, North American Title Company, Novare National Settlement Service, PGP Title, S&S Title Company, Strategic Title Company, Title Clearing & Escrow, Titlevest Agency of Texas, Titlevision Texas, and WFG Lender Services. After the scandal at Millennium Title, it’s surprising to see them on the nice list instead of the naughty list. We’ll need to check the next year’s report for that. Don’t see your favorite company on the good list? 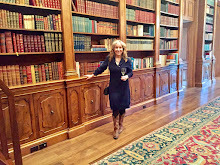 That’s because there were a few rule breakers disclosed amongst our D-FW area companies. Their 2016 fines range from $33 to $3,825.